She's the new desert planet hero with the adorable and sassy droid companion in Star Wars. When she's not crawling around massive downed Imperial Star Destroyers scavenging for parts, she's piloting the Millennium Falcon and using her force powers to take on Kylo Ren. She's got the determination of a hungry Wampa and the intuition of a Jedi Master. Not to mention she's a champ with that staff of hers (pro tip: we sell one of those!). She quickly became our favorite character in the movie and we just had to get our hands on the costume! But... it would be rude just to keep it to ourselves, wouldn't it? 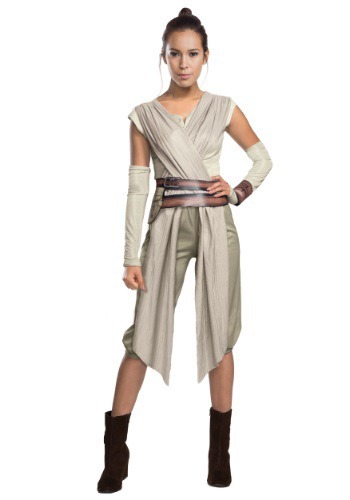 If you'd like to get your hands on some of Rey's threads, this Deluxe Star Wars Rey costume really captures that modest, Jaaku scavenger look she has when we first meet her in The Force Awakens. (Just don't call her scavenger scum. Not cool!) When you go in this officially licensed costume, we're guessing that you're going to be able to do some pretty fantastic and heroic things while wearing it like fighting Kylo Ren or just taking the time to save the neighbor's kitten from a tree. Totally up to you! And since you've probably already left Jakku behind you won't need eye protection from the sun and sand but if you want the full look don't forget to grab the Rey eye mask with a hood to complete the costume look. We're still working on the finding a speeder, but if you're anything like her, we're guessing you'll be able to whip together one yourself from some spare parts. Let us know what it's like when you're out there zipping around on that thing! Such better quality than I expected!